Bereit für eine einzigartige Reiseerfahrung? Südkorea bietet sie dir - und mehr. 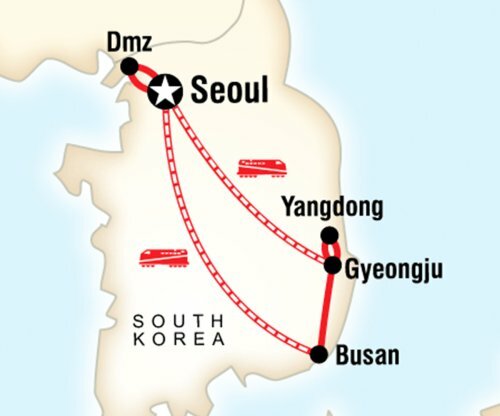 Auf dieser 8-tägigen Rundreise siehst du die Highlights in und rund um Seoul und besuchst Folk Villages und einzigartige koreanische Tempel. Lerne die düstere Geschichte zwischen Nord- und Südkorea kennen und mache einen Ausflug in die Demilitarisierte Zone, die die beiden Länder trennt. Dies ist die perfekte Einführung in ein Land, das gerade dabei ist, sich wieder als Top-Reiseziel zu etablieren. Die Unterbringung erfolgt im Doppelzimmer und im Mehrbettzimmer (Tempel). Alleinreisende teilen sich das Zimmer mit einem/einer weiteren gleichgeschlechtlichen Reiseteilnehmer/in. Gegen Aufpreis ist auch die Unterbringung im Einzelzimmer buchbar (keine Einzelunterbringung im Tempel möglich). Plane 275-360 USD für nicht inbegriffene Mahlzeiten ein. Arrive at any time. Welcome to Seoul! As fellow travellers are arriving throughout the day, there are no planned activities until a group meeting at 6 pm. Check into the hotel and enjoy the city. After the welcome meeting, join your CEO for an orientation walk down Cheonggyecheon Stream to learn about Seoul while walking past small waterfalls and nearly two dozen overhead bridges. Then, enjoy the dense grid of streets found in the bustling neighbourhood of Myeongdong which is packed with people at all hours of the day looking to enjoy some of the best shopping, street food, and nightlife in all of Korea. Opt for a group dinner to end your first night! Arrival Day and Welcome Meeting, 1h 18:00Evening. The adventure begins tonight. Feel free to explore before your welcome meeting, but make sure you’re back in time to meet the group. After introductions, your CEO will review the details of your tour. Please note that normal check-in times apply at our start hotels, but you can usually store your luggage for the day if you arrive early. Enjoy a brief walk with your CEO. He/she will give you some tips on finding things like supermarkets, main squares, and ATMs. You'll be taken through Cheonggyecheon Stream which is an 8.4 kilometre (5.2 mile) waterway and public space that runs through the heart of downtown Seoul. Myeongdong is another popular spot you'll hit on your orientation walk. This exciting district features street food carts, major shopping malls, and entertainment. 50000KRW per person. Check out what all the fuss is about and go see NANTA, Korea’s most popular show. Watch the story of four crazy chefs told, not through dialogue, but through the rhythmic banging of knives, pots, and pans. Performed on Broadway, the show has attained international success. Free. Really get to know Seoul with a stop at the Seoul Museum of History, which highlights each segment of the city's past from the Stone Age to present day. Discover one of the museum's recent creations – a large floor map of Seoul, great for plotting out your next steps! 50000KRW per person. This innovative musical comedy show incorporates many of Asia’s martial arts, including Korea's Taekwondo and Taekkyeon, as it tells the story of a family of martial arts specialists who have to defend their house from robbers. Gwangjang Market is one of the oldest and largest traditional markets in South Korea, with more than 5,000 shops. Famous for its fabric, local treasures, and noted to be one of the best places to go for authentic Korean street food in Seoul, you don't want to miss Gwangjang Market. Located within the grounds of the Gyeongbokgung Palace, learn about the history and traditions of the Korean people during the Joseon era. Visit one of the most important Buddhist temples in Korea and a symbol of Korean Buddhism. Be transported back 600 years into Seoul's past while walking through Bukchon Hanok Village, which boasts the largest cluster of privately owned traditional Korean wooden homes (hanok) in Seoul. Keep an eye out for the half-dozen or so alleys that have beautifully restored architectural features like small courtyards, decorative outer walls, and dark tiled roofs. Explore the narrow and hidden alleys of one of the most memorable places in Seoul. Now filled with antique shops, galleries, tea houses and traditional restaurants, this area once housed the royal studio for painters during the Joseon Dynasty. Visit the Demilitarized Zone (DMZ) between North and South Korea. With over a million soldiers on watch each day, it is one of the last remnants of the Cold War. Spend about 3-4 hours visiting the Demilitarized Zone. On your way there pass by the Blue House, home to the President of the Republic of Korea and South Korea's official government complex. The DMZ was founded in 1953 when the Korean war ended and it is highly militarized on both sides. With a buffer zone 4km wide and spanning 250 km long separating North and South Korea there has been very little development in the area, therefore nature and wildlife have pretty much taken over. Later, return back to Seoul for another night in the city. A DMZ shuttle bus will be used within the DMZ area. Purchase tickets in advance if you want to fit in a K-Pop concert! Recognized by Time magazine as "South Korea's Greatest Export," K-pop (an abbreviation of Korean pop), is a musical genre with girl and boy bands singing, rapping, and performing synchronized dance moves. Taking in a K-Pop concert by one of the many K-Pop groups is a spectacle in itself. Free. Get into the grit of things with a visit to Seoul's Itaewon neighbourhood, the happening place to go. Immerse yourself in bars, clubs, restaurants, and shops, selling everything from tailored suits to furniture, jewelry, and pottery. Free. If you love history - dive right into The War Memorial of Korea. The memorial building serves to exhibit and memorialize the military history of Korea and preserve materials related to the Korean War. Divided into indoor and outdoor exhibits containing about 9,000 artifacts, there sure is a lot to see here! 35000KRW per person. An instructor will walk you through the Kimchi making process, after which you will make your own with various seasonings to be made to your liking. Also, choose to try wearing various kinds of Hanbok, a traditional Korean dress for semi-formal or formal attire during traditional occasions such as festivals, celebrations, and ceremonies. There will be hair accessories and hats as well if you'd like to have the full Korean experience and take some photos! Travel to Gyeongju and visit the UNESCO-listed sites of Seokguram Grotto and Bulguksa Temple on an included tour. Depart Seoul in the morning and travel by high-speed train to Gyeongju, taking just over two hrs to reach the city. 2000KRW per person. The Daereungwon Tomb complex in Gyeongju holds 23 tombs that are found inside of large mounds. The complex is beautiful with its rolling mounds and gardens, but the real treat can be found inside the tombs, the most famous being Cheonmachong and Hwangnamdaechong. Each tomb holds thousands of relics that gives us a window into the Silla Dynasty and its royal family. The contents of these tombs are over 1,500 years old and a great treasure to anyone who enjoys Korean history and artistic beauty. 2000KRW per person. Also known as 'Donggung Palace and Wolji Pond', it was once a part of the royal palace complex of the ancient Silla dynasty. A long-term renovation project beginning in the early 19070's that excavated thousands of relics from the pond has brought Anapji back to its former glory. Anapji Pond is popularly visited in the evening for its beautiful night views when everything is lit up and reflecting amongst the waters. Free. Nestled in the heart of Gyeongju, the capital of the former Silla Kingdom, Cheomseongdae may not appear to be a monumental landmark. But this observatory tower that dates back to the seventh century is actually the oldest existing astronomical observatory in all of East Asia. Cheomseongdae was used for observing the stars in order to forecast the weather in the ancient scientific hub of Gyeongju. 5000KRW per person. Hiring a bicycle is a great way to reach the sights. Cycle past Cheomseongdae Observatory, Anapji Pond and much more! Visit sights around Gyeongju on an included tour. See the UNESCO sites of Seokguram Grotto and Bulguksa Temple and much more. Seokguram Grotto and Bulguksa Temple are very significant to Korean culture and Buddhism. The Seokguram Grotto is symbolic of a spiritual journey into Nirvana and the Bulguksa Temple is a head temple of the Jogye Order of Korean Buddhism and encompasses seven National treasures of South Korea. Take a day trip to Yangdong Folk Village, a UNESCO site, before continuing to Busan to visit the Haedong Yonggungsa Temple and relaxing with a trip to Haeundae Beach and Dongbaek Island (APEC House). Take a private van to visit the 500-year-old UNESCO site of Yangdong Folk Village, located in Gyeongju National Park, to get a feel for life during the early Joseon Dynasty. Visit Haeundae Beach, one of Korea's most beautiful beaches. Enjoy a walk along the shore, or take a swim (don't forget your suit!) And see the famed APEC House built to host the Asia-Pacific Economic Corporation (APEC) summit meeting in 2005 on Dongbaek Island. Visit the bustling Jagalchi fish market, Gukjesijang market, and Yongdusan Park, before an overnight in a local temple. Stay in rooms called Ondol. These rooms are very traditional, heated to be cozy and comfortable, with beds made up directly on the floor. The rooms here are multi-share, divided up by male and female rooms. Enjoy a traditional dinner and breakfast during the stay. 8000KRW per person. With incredible views day or night, Busan Tower is a symbol of Busan that stands proudly 69 m above sea level at a height of 120 m and allows for 360 degrees of viewing pleasure! Fun fact: the top of the tower is modelled after the baldaquin of Dabotap Pagoda in Bulguksa Temple. Gukjesijang or Gukje Market is nestled near Biff Square, a well-known modern movie district in Busan. The market once was a place for refugees to earn a living over the period of the Korean War. Now, it's a bustling international market where loads of food, home goods, clothes, souvenirs and more can be found. Visit Yongdusan Park, home to more than 70 different types of trees, and see the 118m (387 ft) high Busan Tower. The park's unique shape is said to look like a dragon's head. Free. Banpo Bridge is home to the Moonlight Rainbow Fountain Show and is the world's longest bridge fountain. Nearly 10,000 LED lights and 380 water spraying nozzles make up this beautiful show of water, music, and lights. During the day, the fountain shows a hundred different configurations meant to evoke waving willow branches and willow leaves. When the sun goes down, the fountain is illuminated as it sends out dancing, rainbow-coloured jets of water in the air in synchronization with music. 10000KRW per person. Namsan Seoul Tower Observatory allows for an incredible 360 degrees panoramic view of Seoul. The top of the tower is 480m above sea level, including Namsan Mountain (243m) and the tower’s own height (236.7m). It has quickly become a well-known landmark in Seoul and has appeared in lots of smash-hit K-dramas and movies. Gangnam has plenty to do and see in this historically rich, fast-developing neighbourhood. Gangnam Station is the busiest subway station in Seoul and has a huge underground shopping centre, so feel free to shop until you drop. Choose to visit Bongeunsa, a Buddhist Temple in the centre of Gangnam, or enjoy the nightlife and restaurants in this area. The floating islands are a culture complex made up of three man-made floating islands located near one end of the Banpo Bridge. LED lights surround the islands and create a fantastic night view - a must see if you're in Seoul! Dating back to 1414, this is Korea's oldest traditional market and it's largest, with over 10,000 vendors spanning several city blocks. Get ready to shop! Take the cable car to visit the most iconic landmark in Seoul! Located at the top of Mt Namsan, and standing at 480m above sea level, what used to be a broadcasting station before it was open to the public, is now a beautiful observatory. If you'd like to go up the tower to the observatory an additional fee is required.